In Venezuela came the dual power. The country was in the sharpest political crisis, and the United States of America, which openly supported opposition leader Juan Guaydo, the founder of the Popular Will Party, had a hand in this. On January 23, Guaido declared himself the interim head of state, noting that the constitution gives him the right to appoint new presidential elections. 35-year-old Juan Guaido made his statement in Caracas in front of a large crowd of his supporters during mass protests against the authority of Nicolas Maduro. The opposition brought residents of the capital and other Venezuelan cities to the streets, and the events of the beginning of the week were the formal reason for the demonstrations, when an attempt of insurrection by National Guard employees was suppressed for a short period of time, and Guaido was dismissed from the post of head of the Venezuelan parliament, which is called the National Assembly. Defense Minister Vladimir Padrino Lopez said that the army remained on the side of Maduro. According to him, the soldiers cannot accept the president, who is called upon to protect the interests of others, especially since he is self-proclaimed and illegal. Barely a second hand made several turns, as US President Donald Trump announced the recognition of Guaido in the status of interim president. Several states followed the example of the United States, including Brazil, Colombia, Peru, Canada, Argentina and other countries. The head of the White House called Maduro’s power illegal, stressing that the United States is ready to use all its diplomatic and economic leverage to bring democracy back to Venezuela. Trump called on other countries in the Western Hemisphere to join forces to restore constitutional order in this South American state. The President of the United States separately noted that Maduro and his regime are responsible for any threats to the security of the Venezuelans. The head of state, who still considers himself acting, spoke on national television. There were harsh statements on the screen, addressed to both Guaydo himself and his Western curators. 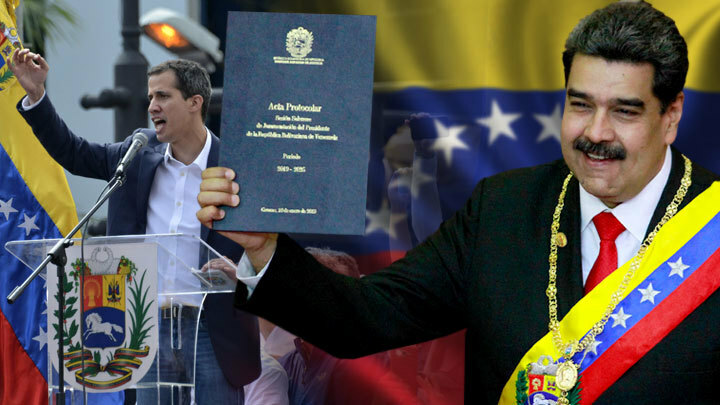 He accused the United States of wanting to change in Venezuela the legitimately elected president he dislikes, using methods that violate the country's constitution. In this regard, Maduro announced that he is breaking off diplomatic and political relations with Washington. Speaking about his opponent, he called the attempt to seize power "senseless", and Guaido himself - a servant of the imperialists. Maduro appealed to his fellow citizens with a call to deal with the arisen contradictions within the country independently, without the intervention of foreign states. However, now it is impossible to talk about some kind of unanimity inside the country. In the international arena, too, is not all clear. Cuba and Bolivia expressed their support for Maduro. In Mexico, they first declared a neutral position on the conflict in Venezuela, however, when the representative of the Mexican government, Jesus Ramírez Cuevas, was asked on television whether he recognized President Nicolas Maduro, the politician answered in the affirmative. It is known that the Kremlin supports Nicolas Maduro, who won the elections in May 2018. The President of Venezuela has already passed a test of strength in 2017, when large-scale protests were held throughout the country for several months. Then it led to the death of about 120 people, several thousand were injured, and more than five thousand protesters - prison sentences. It is not excluded that the day of January 23 was chosen for the self-proclamation of Guaydo for a reason. For the Venezuelan people, this date is very symbolic. Exactly 61 years ago, as a result of an uprising supported by the military, Marcos Perez Jimenez was overthrown - the last representative of the “era of the great dictators of Latin America” of the 40-60s of the last century. Venezuelans in despair. In December, the minimum wage in the country was 4.5 thousand Bolivars. With the advent of the new year, it was raised to 18 thousand Bolivars, that is, four times. However, in the late autumn of 2018, the cost of the grocery set was 183 thousand Bolivars. Rising prices for the last 12 months amounted to 80 thousand percent. IMF experts predict even greater hyperinflation. Large-scale problems in the country are not only with money and food, but also with medications, basic hygiene items, which leads to regular outbreaks of measles and diphtheria, which in civilized countries in the 21st century are hardly remembered. Not surprisingly, over the past four years, three million refugees have already left Venezuela. The above-described poverty of the situation of the population of the country is still not a reason to unceremoniously interfere in its internal affairs. But for the United States, too many interests are affected here to simply stand aside. Here they are worried about Venezuelan oil, and the pro-Russian Nicolas Maduro, and the general lack of influence in the region. So Guaido's recognition is another example of how the concept of international law can be discredited in favor of one or several countries.